*Reader’s Thought: A corollary to Product Excellence is Personal Excellence; are you iterating your own skills and habits to be a “great” person? The authors assert that their approach is applicable beyond startups and high tech, but do not provide any data or evidence to support this statement. The purpose of corporate culture is to attract the right people. Google follows the “Rule of 7”: Every manager must have at least 7 direct reports so that they don’t have time to micro-manage and are forced to delegate. Try to keep a Functional organization as long as possible: Divisional organization tends to build silos. Use small teams to pursue breakthroughs. “Your title makes you a manager. Your people make you a leader.” Debbie Biondolillo. At least 50% of your senior managers should be product people (responsible for designing and/or building your products). Knaves vs. Divas: Knaves behave badly because of low integrity, and should be rooted out. Divas behave badly because of high exceptionalism…but sometimes they are worth it. “Don’t Be Evil”: This is Google’s equivalent of Toyota’s andon cord, which is pulled whenever something seems to be going wrong. Everyone has to stop and figure out the problem before proceeding. Strategy: Bet on Technical Insights that help solve a Big Problem in a Novel Way, optimize for Scale, not for revenue, and let Great Products grow the market for everyone. Competitive advantages don’t last long so scale quickly. Shrink your company to the point where external transaction costs exceed the internal coordination costs. Focus on potential and talent. Reader’s Note: The authors describe Marine Corps decision making as one person giving the order, which must be followed. They clearly don’t understand anything about how the military, and especially the Marine Corps, actually works! Meetings: Google meeting rooms have two projectors; one for video conferencing or meeting notes, the other for projecting data. Decisions should be data-driven. A coach isn’t better than the player at the sport; coaches have a different skill: They can observe players in action and tell them how to be better. Googlers post all their OKRs on the company intranet. Reader’s Note: Every company should strive for this kind of clarity of expectations and purpose. Exercise: Write a self-review. would you work for you? 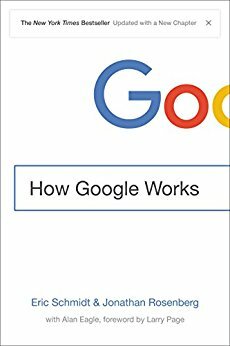 Build a prototype as quickly as possible: Google Books came about when Larry Page bought some equipment from Fry’s and used a metronome to coordinate his taking photos of books while Marissa Mayer turned the pages. Google Street View came about after Sergey Brin drove around town taking a photo out his window every couple of seconds. 20% time: Paul Bucheit created Gmail and hacked the ad server to target ads against email text, which eventually led to AdSense, all against direct orders. “In a ship-and-iterate model, leadership’s job must be to feed the winners and starve the losers, regardless of prior investment.” Contrast this with Jonathan’s experience at Excite, where lagging sections got better placement so they could hit their management targets. Appeal to smart creatives by creating an environment where they can succeed at scale. People often don’t like to ask hard questions because there aren’t any good answers. That’s why they need to be asked.